With Halloween coming up, they are having a Halloween sale, 31% off. However, almost nothing on my wish list is discounted, so I guess not many companies are participating. Also sort of Halloween related, apparently someone found the original, full length (or longer) version of Who Goes There? by John W. Campbell Jr. (aka the basis for the movie The Thing) and Wildside Press is doing a Kickstarter to publish it. I backed it at the ebook level, I first came across it as a kid in the 70s as part of a comic book adaption in a short lived series called "StarStream"
Pathfinder Technical Manual For Starships & Spacemen 2e - Probably not actually rules, as it's mostly a map and a ship for players to use in that game, I guess. $3, 25 pages. I am terrible at embedding KSes, but anyway, Realms Beyond is a CRPG sort of inspired by the Gold Box games. At least it mentions them and the box it comes in (if you get physical) looks like one. On the other hand, it also mentions Realms of Arkana, a game which I literally threw out my window after my party died after losing all their shoes while crossing a mountain, causing damage every time they moved. Highdark Hall - This is apparently a gothic adventure for some gothic RPG that seems to be OSR. $3.99 and 87 pages. RPPP #50 - Archer Class for Lion & Dragon - Apparently no claim of it being "medieval authentic" though. 99 cents, 5 pages. The Chaos Gods come to Meatlandia - Vivimancer Edition - Eh? $9.99 and 80 pages. The Witch for Swords & Wizardry White Box - $4.99 and 120 pages, which I think is almost as long as White Box itself. 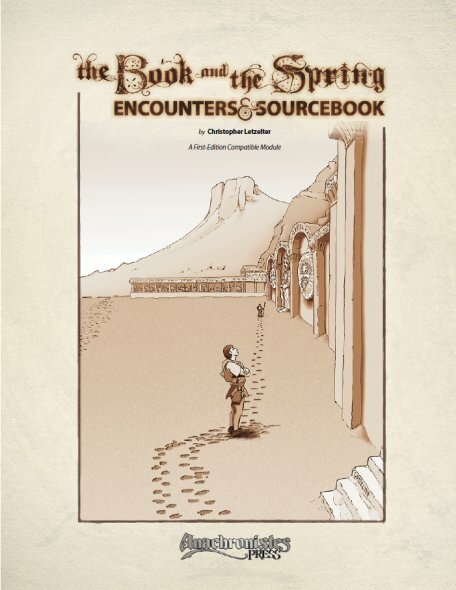 The Book and The Spring is a mid level module for 1st Edition, though it seemingly borrows a bit from Adventures Dark and Deep, the idea of different monsters having different types of hit dice (d4 for small ones, up d12 for large ones). It's from Christopher Letzelter and his Anachronistes Press and is a bit unusual for two reasons. Firstly, it's mostly inspired by Sumerian culture, and secondly, it's split into two separate products — the module itself, and the map/supplement book. I suppose it's also a bit unusual in the premise, which seems like the second half of the adventure (or campaign, even). The PCs are tasked with destroying an evil artifact, a book, by submersing it in a holy spring. However, the spring has dried up thanks to a magical curse by an evil king, now undead. But they can't kill him until they open his tomb, which requires finding keys. Thankfully that can easily be ignored, since essentially you have a small sandbox setting with several sites for the PCs to explore, though three in particular are the largest and most detailed: A ruined palace, a tomb, and the ruins of a hanging gardens style structure. Each room is given a physical description, sometimes quite lengthy and often includes dimensions (which some people like but others seem to hate). Apparently we skipped Fall and went straight to Winter, with a high in the 40s. Bought last week's The Book and The Spring. Should have a review next week. But it's pretty nice. Also started working (again) on RL2 The Charnel Pits of Reynaldo Lazendry with the hopes of having it done by Halloween. It's surprisingly slow turning notes from your game into a module. (Also for some reason, spellcheckers don't like charnel). Gamma World 1e - This is actually the only version I've played, back in the day. $9.99 for the PDF and $19.99 for the softcover. Kinda expensive given the size of the book (64 pages) but apparently includes a map. The Beholder Contracts (free at DTRPG/RPGNow) by David Whiteland/DWK Games is not about the eye monsters, but more literal. It's a very interesting twist on the "person hires characters to retrieve object" trope. Apparently it was first published in the 1980s in a magazine (don't know which) but has been revised and re-laid out. 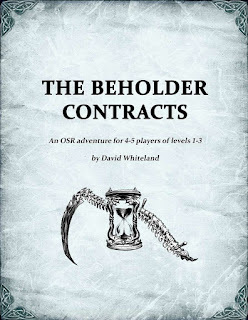 It's for 1e and makes some references to the diseases tables, but should work with most OSR games. Very much worth checking out. Fairly busy week. The previously posted Bruce Heard kickstarter has gone live and is almost funded as I write, $7800 of the $8000 goal. Bloodbath Bunnies - The author was trying too hard to be funny in the description and I'm not sure what this is exactly. 99 cents though and from the author of the Oldskull stuff, so the 30 pages might have 5 pages of actual content. Dark Places & Demogorgons - The Ghost Hunter's Handbook - Adds new classes and more to the modern horror game. $4.99 and 60 pages. The Oneiromancer - New character class for S&W whose powers revolve around dreams. Wait, that's useless you say, but sleep is one of his spells, so maybe not. Also seems to cast illusionist spells, which is a bit odd, but eh. PWYW and 5 pages. Deities and Personalities of DarkMoore - Free setting info about the DarkMoore setting. 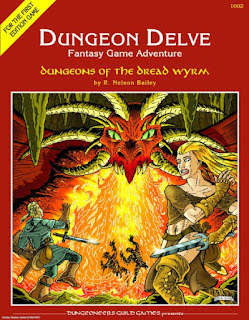 Dungeons of the Dread Wyrm is the 2nd module in the Dungeon Delve series, which I've until now overlooked (I don't follow social media much anymore, to be honest, so presumably missed any announcement). 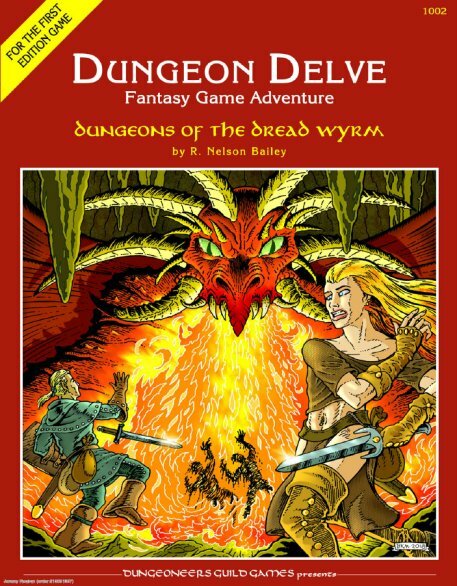 It's a high-ish level adventure, 10th to 14th levels, written by R. Nelson Bailey for First Edition. Apparently it was originally Kickstarted and so contains entirely new original art, which also explains the price tag of $9.99 and 32 pages for the PDF. Notably, it includes art by by the Fiend Folio guy, Russ Nicholson*. It has no real plot, other than a dragon has been extorting a kingdom for a while now and is getting tired of it. So if the PCs would go and kill it, it would be greatly appreciated. The dragon has built a mid sized (by today's standards) 3 level, 40-ish keyed encounters dungeon to protect her wealth and herself, filled with traps, tricks, and her flunkies, wit the last level being her lair proper. Calidar being the new world by Bruce Heard of Mystara/Princess Ark fan and something that has exceeded my expectations as a new creation.